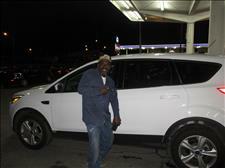 Mr. Graham is the proud new owner of this new body Ford Escape. 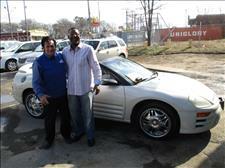 Thanks again and enjoy your new ride. 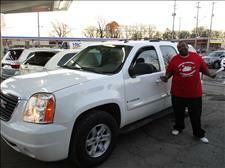 Mr. Fowler is now riding this Beautiful GMC Yukon. We appreciate your business and ride-rite. 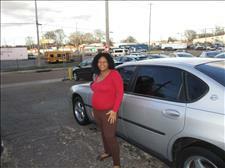 Thanks to Ms. Melton for the purchase of this very nice Chevy Impala with the leather. 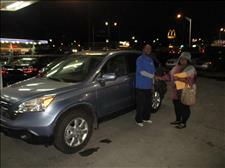 Thanks again and enjoy your new ride. Thanks to Ms. Smith for the purchase of this loaded Honda CR-V. We truly appreciate your business and enjoy your new ride. Mr. Boddie purchased a beautiful 2013 Dodge Charger with the chrome wheels but his girl got so excited, she drove off before we could take a picture. Thanks again and enjoy your new ride.